Breeding Worth (BW) and Breeding Values (BV) are presented as the difference between an animal’s genetic merit and the ‘genetic base cow’. In June 2016, the genetic base cow, which is the genetic reference point for all dairy cattle in New Zealand, became younger, as we moved from a 2000 to a 2005 born genetic base cow. The previous genetic base was the average of a group of well recorded 2000 born cows. In June 2016, the genetic base used for calculating Breeding Worth (BW) and breeding values became "the average of a group of well recorded cows born in the year 2005". BW and Breeding Values (BVs) are now expressed relative to this genetic base. *Previous BVs are calculated using the 2000 born genetic base. These BVs are indicative of the rescaling for each trait. For example, The previous Protein BV of the new genetic base is about 5.12kg. All Protein BVs were rescaled backwards by 5.12kg following the base cow update on June 19. **This weight is calculated using liveweight data collected on a subset of the base cows (approximately 50% of the base cows were weighed). It is worth noting that NZ farm systems have changed a great deal since 2007, and this value should not be used to estimate the expected mature liveweight of NZ dairy cattle today. On 19 June 2016, the genetic base cow, which is the genetic reference point for all dairy cattle in New Zealand, became younger, as we moved from a 2000 to a 2005 born genetic base cow. The genetic base increased by about $50 causing Breeding Worth (BW) to be scaled-back by an equivalent amount across all animals and herds. This change did not cause any re-ranking among bulls or herds nor was it an indication of a change in the value of an animal. Every year we see genetic improvement in the national herd; which leads to each group of heifers coming through having a higher BW than those cows before them. A genetic base cow update, usually every five years, prevents the gap between the today’s animals and the genetic base becoming too large, keeping the scale of Breeding Worth relevant. The next update to the genetic base cow will occur in 2020, when we will move to a 2010 born genetic base. 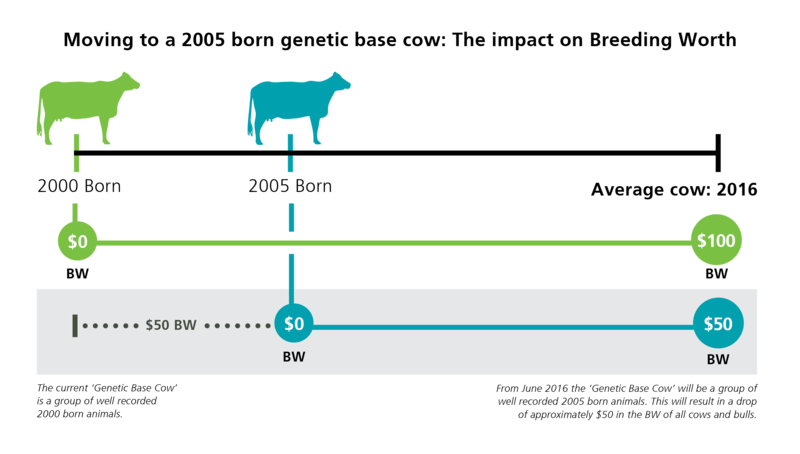 A BW of $100 indicates that the animal has the genetic potential to create $100 of additional profit each year, compared to the genetic base cow. Download a factsheet with all the information about the genetic base cow updates here.